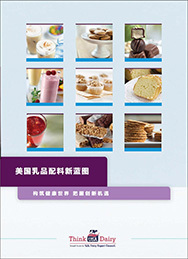 16-page brochure in Chinese (simplified) providing an overview of the functionality, nutrition and versatility of U.S. dairy ingredients. Products include whey protein, milk protein, hydrolyzed whey, milk derived whey, micellar casein concentrate and permeate. Published in December 2014 in collaboration with the Chinese Institute for Food Science and Technology (CIFST) and disseminated as an insert in China's Food Technology magazine, Issue 2014-4.